Animal-Assisted Therapy utilises animals in therapeutic work with humans. There are many ways that animals can be involved in working with humans - education, rehabilitation, physiotherapy or occupational therapy, counselling or to assist in learning life skills. In Animal-Assisted Therapy the therapist will identify the therapeutic or clinical goals, and use the animal to help them achieve these goals - DeltaSociety (USA) defines AAT as goal directed interactions with clearly defined and measurable outcomes. This distinguishes Animal-Assisted Therapy (AAT) from the less structured Animal-Assisted Activities (AAA). In both cases therapy animals interact with people to produce positive outcomes, however in animal-assisted activities the role of the animal is less defined and so is the outcome. Whilst AAT will have prescribed therapeutic outcomes, AAA may simply aim to achieve a positive environment or help an individual to feel good. So what is the difference between Assistance Dogs and Therapy Dogs? Assistance Dogs are not the same as Therapy Dogs. Assistance or Service Dogs are trained and accredited to provide a particular service to an individual with an illness or disability (e.g. Guide Dogs for the Blind). These dogs are not considered ‘pets’. Dogs are also trained to perform a range of physical tasks for people, such as picking up objects, opening doors and alerting to sounds. Other dogs have been trained to detect early signs of seizures or blood sugar changes and are able to alert their owners. Some of these dogs may actually be called Therapy Dogs (e.g. Pets As Therapy program). They provide people with contact to animals, but are not limited to working with people who have disabilities. They are usually the personal pets of their handlers, and/or, work with their handlers to provide services to others. Assistance Dogs can be registered in most Australian states under Guide-Dog or Anti-Discrimination legislation. Because of their important functional and often life-saving roles, Assistance Dogs may be granted 'public access', legally allowing them access into public buildings, transport and even restaurants and hospitals, indeed anywhere their humans go. This legal right does not extend to pets or dogs used in AAI programmes. Whilst Therapy Dogs are able to receive training, registration or certification for insurance or legal purposes, they do not perform life-saving functions and are hence not allowed 'public access'. 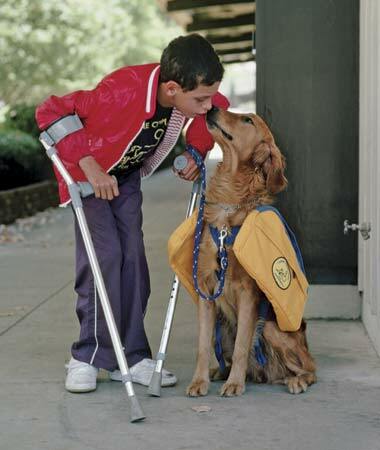 Assistance or Service Dogs are legally defined and trained to meet the disability-related needs of their handlers. Therapy Dogs are not legally defined by federal law. A Companion Dog is not legally defined, but is accepted as another term for pet. They often are dogs that did not complete assistance or service dog training due to health, disposition, trainability, or other factors, and are made available as pets for people who have disabilities. These animals might or might not meet the definition of service animals. On 15 Mar 2011 the definition of a "service animal" under Americans with Disabilities Act (ADA) changed and now defines a "service animal" as a dog that has been individually trained to do work or perform tasks for the benefit of an individual with a disability. The Act also allows trained miniature horses as alternatives to dogs, subject to certain limitations. For further information on these changes, please go to Sect. 35.136 Service Animals in Part 35 Nondiscrimination on the Basis of Disability in State & Local Govnt Services (as amended by the final rule pub on Sept 15, 2010) U.S. Dept of Justice.